Amanda Lane is an artist specializing mainly in ceramic sculptures. She is the wife of Vincent Lane and the mother of Summer, Wind, Penny, Trent and Jane Lane. 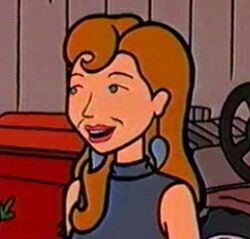 Amanda has only two speaking appearances, in episodes "Lane Miserables" and "Art Burn", often being absent from Lawndale. In fact, Vincent and Amanda's constant absence from the Lane household, a recurring theme in Daria, is often mentioned in passing during some episodes by Jane, though she does not seem too upset by it. In one episode, Jane herself describes Amanda and Vincent's parenting as "benign neglect". From her appearance in "Lane Miserables" and her housekeeping notes in "The Daria Database", Amanda seems a very mellow and relaxed woman, maintaining a extremely laid back attitude regarding parenthood, ignoring the problems and confusion around her and being somewhat lax in enforcing rules, standards, or even basic cleanliness around her house. She's also unsure (and unconcerned) about who's in the house at any given time, mentioning in "Database" that squatters might be in the basement "again" and "I'm pretty sure they're harmless"; she didn't bother to investigate and see if they were there, even though she thinks it could be some of her children. This behavior eventually catches up with her in Lane Miserables, when the sudden concentration of the Lane family members in her house overwhelms her and she must go to Helen because "I need my house back!" Regarding raising children, Amanda likes to quote a proverb of holding a butterfly in one's hand. (Jane is fed up with hearing it but holds her tongue.) She's willing to let her children do whatever they want in order to find themselves, to the extent that she's unconcerned when her grandchildren Adrian and Courtney run away to the Lane house without their mother. She claims to be proud of having "such interesting and articulate children and grandchildren", though she's forced to recant her philosophy when all of her children suddenly come home at once. She also admits in "Art Burn" that, rather than let him choose, she and Vincent made up a story to stop Wind from changing his name to Ronald. Amanda has cited letting Trent camp in the back garden until he got bored as successful parenting; she doesn't know that Trent was waiting for someone to invite him back in and is depressed by the memory. Amanda is seen working in her workshop with a kiln and a potter's wheel when she is at home. In the broadcast episodes, it appears that her workshop is in the basement of the Lane house (though the map of Lawndale in "The Daria Diaries" indicates it is in an old bomb shelter). "The Daria Database" shows that Amanda isn't bothered by the mess at home, and is lax on basic maintenance. She's also absent-minded about whether bills have been paid and tends to leave blank cheques behind for Trent and Jane to use. Vincent and Amanda are often in completely different parts of the world to each other. "The Daria Database" mentions an exception, when they toured East Europe together. Vincent once said to Wind that Amanda and himself try to work out their marriage issues by role-playing and hitting each other with foam rubber bats. One of MTV's websites is "LaneBay": Jane started selling her family's stuff online to pay the rent and now all the Lanes want in on it. Amanda's ceramics were on sale, including a vase, a spoon rest, and a spirit vessel. The spirit vessel can't contain soup and Amanda "forgot to leave a hole to put the flowers in" on the vase. We also learn she doesn't cook. In Daria fanfiction, Amanda is usually portrayed as an absent mother, similar to her canon characterization, with Jane or Trent saying in passing that their mother is somewhere far away from Lawndale (usually outside the USA) or that they do not know his whereabouts at all. The Man Next Door by Sacred Dust, in which Amanda returns permanently to the Lane house to be a more dependable parent to Jane and Trent but must face her difficult past as well. The John Lane series, by Richard Lobinske, starts by Vincent and Amanda being found to be unsuitable parents and relinquish their parental rights to the Morgendorffers, thus setting the premise of the series. Amanda is characterized as being even more aloof than in canon. Amanda appears in John and Retouched Parents. In the Last Summer and Falling into College series, by Richard Lobinske, Amanda makes guest appearances in It Was Your Idea, Lane Closure and Lindy Lane. Amanda plays a relatively large role in Wouter's Dariarotica comic Growing pains where she unsuccessfully tries to give her old hand-me-downs to Jane. Amanda is depicted as having a zany but surprisingly sharp character. The comic also show Amanda bonding with Jane. This page was last edited on 6 April 2018, at 00:35.